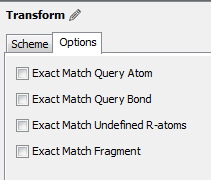 Scheme tab: Edit transformations as reactions here. Do not forget mapping: by default, Standardizer assumes that changing atoms are mapped (ChemAxon mapping style). Options tab: Set the Match Options to filter the input molecules. The transformation will only be executed if the input species meets the selected matching options. Find details on matching options here. Resetting default search options: remove "transform" from the standardizer list and add it again. For a description of reaction mapping, see the Reaction mapping section of the Reactor Manual.